The aggregate market value (based on the NYSE quoted closing price) of the common stock held by non-affiliates of the registrant as of the last business day of the second fiscal quarter, June 25, 2010, was approximately $0.523 billion. As of January 28, 2011, there were 44,105,588 shares of the registrants common stock outstanding. The information required by Part III of this report is incorporated by reference from the registrants definitive proxy statement, relating to the Annual Meeting of Shareholders scheduled to be held May 11, 2011, which definitive proxy statement will be filed not later than 120 days after the end of the fiscal year to which this report relates. This Form 10-K contains forward-looking statements. These statements relate to our expectations for future events and future financial performance. Generally, the words anticipate, believe, expect, intend, plan, and similar expressions identify forward-looking statements. Forward-looking statements involve risks and uncertainties, and future events and circumstances could differ significantly from those anticipated in the forward-looking statements. These statements are only predictions. Actual events or results may differ materially. Factors which could affect our financial results are described in Item 1A of this Form 10-K. Readers are cautioned not to place undue reliance on these forward-looking statements, which speak only as of the date hereof. Although we believe that the expectations reflected in the forward-looking statements are reasonable, we cannot guarantee future results, levels of activity, performance or achievements. Moreover, neither we nor any other person assume responsibility for the accuracy and completeness of the forward-looking statements. We undertake no duty to update any of the forward-looking statements after the date of this report to conform such statements to actual results or to changes in our expectations. TrueBlue, Inc. (TrueBlue, we, us, our) provides temporary blue-collar staffing services through the following brands: Labor Ready for general labor, Spartan Staffing for light industrial services, CLP Resources for skilled trades, PlaneTechs for aviation and diesel mechanics and technicians, and Centerline for dedicated and temporary drivers. We are a leader in blue-collar staffing services and through our brands we provide a wide range of specialized blue-collar staffing services to our customers. We began operations in 1989 under the name Labor Ready, Inc. providing on-demand, general labor staffing services. In 2004 we began acquiring additional brands to expand our service offerings to customers in the blue-collar staffing market. Effective December 18, 2007, Labor Ready, Inc. changed its name to TrueBlue, Inc. The name change reflects our vision to be the leading provider of blue-collar staffing with multiple brands serving the temporary staffing industry. We are headquartered in Tacoma, Washington. The long-term performance expectations of all our brands are similar as are the underlying financial and economic metrics used to manage those brands. Our international operations are not significant to our total operations for segment reporting purposes. Our fiscal year ends on the last Friday of December. Fiscal 2010 includes 53 weeks ended December 31, 2010. Fiscal 2009 and 2008 each included 52 weeks ended December 25, 2009 and December 26, 2008, respectively. In fiscal years consisting of 53 weeks, the final quarter will consist of 14 weeks while in 52-week years all quarters will consist of 13 weeks. Temporary staffing companies act as intermediaries in matching available temporary workers to employer assignments. Staffing companies compete both to recruit and retain a supply of temporary workers and to attract and retain customers to employ these workers. Temporary workers are recruited through a wide variety of means, including personal referrals, online resources, internal databases, advertisements, job fairs and various other methods. An important aspect in the selection of temporary workers for an assignment is the ability to identify the skills, knowledge, abilities, and personal characteristics of a temporary worker and match their competencies or capabilities to an employers requirements. Methods used to sell temporary staffing services to customers vary depending on the customers need for temporary staffing services, the local labor supply, the length of assignment and the number of workers required. We are a business-to-business sales provider. Our sales process takes place at the customers location. Success is often based on the experience and skill of the sales person and the strength of relationship with the customer. Retention of customers, exclusive of economic conditions, is dependent on the strength of our relationship with the customer, the skill, quality and tenure of temporary workers and customer service skills. The temporary staffing industry is large and highly fragmented with many competing companies. No single company has a dominant share of the temporary staffing industry. Customer demand for temporary staffing services is dependent on the overall strength of the labor market and trends toward greater workforce flexibility. The staffing industry is highly volatile based on overall economic conditions. Historically, in periods of economic growth, the number of companies providing temporary staffing services has increased significantly due to low barriers to entry and during recessionary periods the number of companies has decreased significantly through consolidation, bankruptcies, or other events. During the recent recession and current post-recessionary environment, the temporary staffing industry is experiencing increased volatility in comparison with past economic cycles. This is largely due to the severity of the recession which resulted in a dramatic drop in the use of temporary staffing as companies aggressively reduced the size of their workforce. However, in the post-recessionary environment, the temporary staffing industry has experienced increased demand in relation to total job growth as customers have placed a greater priority on maintaining a more flexible workforce. Our primary objective is to increase revenues generated by our existing network of branch offices. Our network of branch offices focuses on meeting customer needs with market leading sales and service. This strategy produces strong incremental operating profit as we leverage the revenue and associated gross profit over our existing cost structure. Our separate brands each have in-depth industry knowledge and expertise in providing temporary staffing services to customers in their respective blue-collar markets and customer groups within those markets. We have developed proprietary systems and programs to attract and retain temporary workers with skills required by the various blue-collar markets and to match those workers to the needs of our customers. We are committed to being the blue-collar market leaders in customer sales and service. We have built a strong sales-culture backed by sales professionals with a proven track record of selling blue-collar staffing services and a process to expand these relationships into larger revenue streams. We continue to invest in developing our sales programs to identify customer needs and expand our customers use of our temporary staffing to solve their unique challenges. We have also increased our focus on improving our customer service capabilities, and we believe further investment could make a considerable difference in our ability to strengthen and retain customer relationships. We have achieved a leading market position with our Labor Ready brand which specializes in providing on-demand, general labor through a national network of branch offices. We plan to expand all brands into a national presence with dominant market positions. Centerline will leverage our network of branch offices for its expansion in providing temporary and dedicated drivers to the transportation and distribution industries. Spartan Staffing plans to expand with their customers in adjacent markets and into on-site locations where customers have significant requirements for temporary skilled labor in the manufacturing and logistics industries. PlaneTechs has multiple expansion opportunities within aviation and other transportation industries to supply mechanics using our current centralized model which does not require additional office locations. While we do not believe the construction industry will return to its pre-recessionary market size in the near term, we do believe growth will return to this industry. We believe that we are well positioned to serve this market. We retained the expertise and customer relationships to service various types of construction and expanded our service offerings to include remote industrial construction projects, industrial plant repair and maintenance projects and emerging renewable energy projects such as solar and wind farms. As we see meaningful signs of sustainable growth in this market, we will evaluate investments to expand our geographic presence through our CLP brand. We continually evaluate acquisition candidates for fit with our strategy, culture, and the ability to produce strong returns on investment. Our focus is on acquisitions that can accelerate the building of a national presence for all our brands or that provide new opportunities to serve the blue-collar staffing market. Historically, our acquisitions were focused on establishing a platform for specialized staffing services to the blue-collar market. Our future acquisitions will be focused on businesses that are complementary to our current brands which typically produce more synergies enhancing our return on investment. We plan to integrate these acquisitions with our existing brands. We are highly centralized for all back office and shared support programs and activities. Branch operations are dependent on corporate headquarters for most administrative functions. We are committed to leveraging technology and third-party services, and increasing the efficiency of our centralized back office support services as we grow. Our focus on technology and back office support service reduces the administrative work of our branch office employees to focus on sales and service and increases the overall efficiency and profitability of our business. We also remain focused on our risk management programs. Our risk management practices have increased the safety of the work environment for our temporary workers, improved service to our customers, and reduced workers compensation expense. Labor Ready specializes in providing on-demand, general labor to various industries through a nationwide network of local community branch offices. Temporary assignments are generally project-based and filled on short notice for unplanned just-in-time jobs, tough to fill jobs, and recurring short term jobs. At the end of fiscal 2010, Labor Ready operated 606 branches in all 50 states and Canada. Spartan Staffing specializes in providing skilled labor for the manufacturing and logistics industries. Temporary workers skills are matched to jobs for a customized workforce solution which enables our customers to obtain immediate value by placing a productive and skilled employee on the job site. Spartan Staffing was acquired in 2004. In April 2008, we purchased Personnel Management, Inc. which was integrated with Spartan Staffing effective in fiscal 2009. At the end of fiscal 2010, Spartan Staffing operated 50 branches in 11 states. CLP Resources (CLP) specializes in providing skilled trades people for commercial, industrial and residential construction and building and plant maintenance industries. Temporary workers skills are matched to jobs which enable our customers to obtain immediate value by placing a highly productive and skilled employee on the job site. Job assignments are project-based and the skilled temporary worker is often needed for a substantial amount of the construction and maintenance project until completion. CLP was acquired in 2005. In April 2007, we acquired Skilled Services Corporation which expanded our geographic reach for skilled trades services. Skilled Services Corporation was integrated with CLP effective in fiscal 2008. At the end of fiscal 2010, CLP operated 49 branches in 21 states. PlaneTechs specializes in providing skilled mechanics and technicians to the aviation maintenance, repair and overhaul, aerospace manufacturing and assembly industries, and other transportation industries. In-depth screening verifies aviation certification and specialized skills of the mechanics and technicians. In December 2007, we purchased substantially all of the assets of PlaneTechs, LLC. PlaneTechs operates nationally out of one recruiting center, as well as on-site locations at customers with significant temporary workforce requirements. Centralized recruiting and dispatch provides efficient and cost-effective solutions for customers across the country and in foreign locations. Centerline Drivers (Centerline) specializes in providing temporary and dedicated drivers to the transportation and distribution industries. In February 2008, we purchased substantially all of the assets of TLC Services Group, Inc. Effective January 4, 2010, we changed the name of this brand to Centerline Drivers. At the end of fiscal 2010, Centerline operated 15 branches in 9 states. Management of our temporary staffing operations is coordinated from our headquarters in Tacoma, Washington where we provide support and centralized services to our brands and their respective branch offices. As of December 31, 2010, we conducted our staffing services operations through 721 branch offices in all 50 states, Puerto Rico and Canada. Branch managers are responsible for most activities of their offices, including sales, recruitment, servicing the customers needs, accident prevention, and compliance with the laws and regulations. In February 2008, we purchased substantially all of the assets of Centerline (formerly TLC) which included 10 operating branches. In April 2008, we acquired all the stock of Personnel Management Inc. which included 44 operating branches. The majority of our closed branches are consolidated with another branch to retain customer relationships. Our customer mix consists primarily of small and medium-size businesses serviced by one or more branch offices. We also serve larger national customers. These large national customers frequently enter into non-exclusive arrangements with several companies, with the ultimate choice among them being left to the local managers. Customer relationships with small and medium-size businesses rely less upon longer-term contracts, and the competitors for this business are primarily locally-owned businesses. Our full range of blue-collar temporary staffing services and multiple brands enables us to cross-market to customers in order to leverage our relationships and expand our services provided. During 2010, we served approximately 175,000 customers. Our ten largest customers accounted for 18.6% of total revenue in 2010, 21.3% for 2009 and 10.7% for 2008. Sales to The Boeing Company and affiliates (Boeing) accounted for 9.4% of total revenue for 2010, 13.4% for 2009, and 5.1% for 2008. While we predominately serve the small to mid-sized customer, we experienced proportionately more growth from large customers during 2010. However, we expect future growth to include small to mid-sized customers as the economy continues to recover. As of December 31, 2010 we employed approximately 2,600 full-time and part-time employees. In addition, we placed approximately 300,000 temporary workers on assignments with our customers during 2010. We recruit temporary workers daily so that we can be responsive to the planned as well as unplanned needs of the customers we serve. We attract our pool of temporary workers through personal referrals, online resources, extensive internal databases, advertising, job fairs, and various other methods. We identify the skills, knowledge, abilities, and personal characteristics of a temporary worker and match their competencies or capabilities to a customers requirements. This enables our customers to obtain immediate value by placing a highly productive and skilled employee on the job site. We use a variety of proprietary programs for identifying and assessing the skill level of our temporary workers when selecting a particular individual for a specific assignment. We believe that our assessments systems enable us to offer a higher quality of service by increasing productivity, decreasing turnover and reducing absenteeism. We provide a bridge to permanent, full-time employment for thousands of temporary workers each year. Temporary workers come to us to fill a short-term financial need or as a flexible source of income while also working elsewhere or pursuing education. Many stay because of the flexibility that we offer. In many cases, we enable individuals to pay their rent, buy groceries, and remain self-sufficient. Temporary workers may be assigned to different jobs and job sites, and their assignments could last for as little as a single day or extend for several weeks or months. We compete in the temporary staffing industry by offering a full range of blue-collar staffing services. Our industry is large and fragmented, comprised of thousands of companies employing millions of people and generating billions of dollars in annual revenues. We experience competition in attracting customers as well as qualified employment candidates. The staffing business is highly competitive with limited barriers to entry, with a number of firms offering services similar to those provided by us on a national, regional or local basis. We compete with several multi-national full-service and specialized temporary staffing companies, as well as a multitude of local companies. In most geographic areas, no single company has a dominant share of the market. The majority of temporary staffing companies serving the blue-collar staffing market are locally-owned business. In many areas the local companies are the strongest competitors, largely due to their longevity in the market and the strength of their customer relationships. The most significant competitive factors in the staffing business are price, ability to promptly fill customer orders, success in meeting customers quality expectations of temporary workers, and appropriately addressing customer service issues. We believe we derive a competitive advantage from our service history and commitment to the blue-collar temporary employment market and our specialized approach in serving the industries of our customers. Also, our national presence and proprietary systems and programs including worker safety, risk management, and legal and regulatory compliance are key differentiators from many of our competitors. Competitive forces have historically limited our ability to raise our prices to immediately and fully offset increased costs of doing business; some of which include increased temporary worker wages, costs for workers compensation and state unemployment insurance. As a result of these forces, we have in the past faced pressure on our operating margins. Our business experiences seasonal fluctuations. Our quarterly operating results are affected by the seasonality of our customers businesses. Demand for our staffing services is higher during the second and third quarters of the year with demand peaking in the third quarter and lower during the first and fourth quarters, in part due to limitations to outside work during the winter months. Our working capital requirements are primarily driven by temporary worker payroll and customer accounts receivable. Since receipts from customers generally lag payroll to temporary workers, working capital requirements increase substantially in periods of growth. The following table depicts our revenue derived from within the United States and that derived from international operations for the past three fiscal years (in millions). Our international operations include Canada in 2010 and 2009 and Canada and the United Kingdom for 2008. We sold the remaining operations in the United Kingdom in 2008. Our Annual Report on Form 10-K, along with all other reports and amendments filed with or furnished to the Securities and Exchange Commission (SEC) are publicly available, free of charge, on our website at www.trueblueinc.com or at www.sec.gov as soon as reasonably practicable after such reports are filed with or furnished to the SEC. Our Corporate Governance Guidelines, Code of Business Conduct and Ethics, and Board committee charters are also posted to our website. The information on our website is not part of this or any other report we file with, or furnish to, the SEC. Investing in our securities involves risk. The following risk factors and all other information set forth in this Annual Report on Form 10-K should be considered in evaluating our future prospects. In particular, keep these risk factors in mind when you read forward-looking statements elsewhere in this report. Forward-looking statements relate to our expectations for future events and time periods. Generally, the words anticipate, believe, expect, intend, plan and similar expressions identify forward-looking statements. Forwardlooking statements involve risks and uncertainties, and future events and circumstances could differ significantly from those anticipated in the forwardlooking statements. If any of the events described below occurs, our business, financial condition, results of operations, liquidity or access to the capital markets could be materially and adversely affected. The demand for our blue-collar staffing services is highly dependent upon the state of the economy and upon staffing needs of our customers. Any variation in the economic condition or unemployment levels of the United States and Canada, or in the economic condition of any region or specific industry in which we have a significant presence may severely reduce the demand for our services and thereby significantly decrease our revenues and profits. Our business is subject to extensive regulation. The cost to comply and any inability to comply with government regulation could materially harm our business. Increased government regulation of the workplace or of the employer-employee relationship, or judicial or administrative proceedings related to such regulation, could materially harm our business. The Patient Protection and Affordable Care Act and the Health Care and Education Reconciliation Act of 2010 (collectively, the Health Care Reform Laws) includes various health-related provisions to take effect through 2014, including requiring most individuals to have health insurance and establishing new regulations on health plans. Although the Health Care Reform Laws do not mandate that employers offer health insurance, beginning in 2014 penalties will be assessed on large employers who do not offer health insurance that meets certain affordability or benefit requirements. Unless modified by regulations or subsequent legislation, providing such additional health insurance benefits to our temporary workers, or the payment of penalties if such coverage is not provided, would increase our costs. If we are unable to raise the rates we charge our customers to cover these costs, such increases in costs could materially harm our business. We employ individuals on a temporary basis and place them in our customers workplaces. We have limited control over our customers workplace environments. As the employer of record of our temporary workers we incur a risk of liability for various workplace events, including claims for personal injury, wage and hour requirements, discrimination or harassment, and other actions or inactions of our temporary workers. In addition, some or all of these claims may give rise to litigation including class action litigation. Although we currently believe resolving all of these matters, individually or in the aggregate, will not have a material adverse impact on our financial statements, the litigation and other claims are subject to inherent uncertainties and our view of these matters may change in the future. A material adverse impact on our financial statements also could occur for the period in which the effect of an unfavorable final outcome becomes probable and can be reasonably estimated. We are dependent on workers compensation insurance coverage at commercially reasonable terms. We provide workers compensation insurance for our temporary workers. Our workers compensation insurance policies are renewed annually. The majority of our insurance policies are with Chartis, a subsidiary of American International Group, Inc. Chartis requires us to collateralize a significant portion of our workers compensation obligation. We cannot be certain we will be able to obtain appropriate types or levels of insurance in the future or that adequate replacement policies will be available on acceptable terms, if at all. As our business grows or our financial results deteriorate, the amount of collateral required will likely increase and the timing of providing collateral could be accelerated. Resources to meet these requirements may not be available. The loss of our workers compensation insurance coverage would prevent us from doing business in the majority of our markets. Further, we cannot be certain that Chartis will be able to pay claims we make under such policies or release the collateral controlled by them for payment of claims. The loss of the collateral could require us to seek additional sources of capital to pay our workers compensation claims. These additional sources of capital may not be available on commercially reasonable terms, or at all. We must have sufficient sources of liquidity to fund our working capital requirements, workers compensation collateral requirements, service our outstanding indebtedness and finance investment opportunities. Without sufficient liquidity, we could be forced to curtail our operations or we may not be able to pursue promising business opportunities. The principal sources of our liquidity are funds generated from operating activities, available cash and cash equivalents, and borrowings under credit facilities. We expect to continue making acquisitions or entering into new business ventures as part of our long-term business strategy. These acquisitions involve significant challenges and risks including that the acquisition does not advance our business strategy, that we do not realize a satisfactory return on our investment, that we experience difficulty in integrating their operations, or diversion of managements attention from our other business. These events could cause harm to our operating results or financial condition. Our performance is dependent on attracting and retaining qualified employees who are able to meet the needs of our customers. We believe our competitive advantage is providing unique solutions for each individual customer, which requires us to have highly trained and engaged employees. Our success depends upon our ability to attract, develop and retain a sufficient number of qualified employees, including management, sales, service and administrative personnel. The turnover rate in the staffing industry is high, and qualified individuals of the requisite caliber and number needed to fill these positions may be in short supply. Our inability to recruit a sufficient number of qualified individuals may delay or affect the speed of our planned growth. Delayed expansion, significant increases in employee turnover rates or significant increases in labor costs could have a material adverse effect on our business, financial condition and results of operations. We compete with other temporary staffing companies to meet our customer needs and we must continually attract reliable temporary workers to fill positions. We have in the past experienced worker shortages and we may experience such shortages in the future. Further, if there is a shortage of temporary workers the cost to employ these individuals could increase. If we are unable to pass those costs through to our customers, it could materially and adversely affect our business. Accidental disclosure of our employees or customers information could materially harm our business. Failure to protect the integrity and security of our employees and customers information, including proprietary information, could expose us to litigation and materially damage our relationship with our employees and customers. Failure to maintain adequate financial and management processes and controls could lead to errors in our financial reporting. If our management is unable to certify the effectiveness of its internal controls or if its independent registered public accounting firm cannot render an opinion on the effectiveness of its internal control over financial reporting, or if material weaknesses in our internal controls are identified, we could be subject to regulatory scrutiny and a loss of public confidence. In addition, if we do not maintain adequate financial and management personnel, processes and controls, we may not be able to accurately report our financial performance on a timely basis, which could cause our stock price to fall. We have outsourced certain aspects of our business to third party vendors that subject us to risks, including disruptions in our business and increased costs. For example, we have engaged third parties to host and manage certain aspects of our data center information and technology infrastructure and to provide certain back office support activities. Accordingly, we are subject to the risks associated with the vendors ability to provide these services to meet our needs. If the cost of these services is more than expected, or if the vendor or we are unable to adequately protect our data and information is lost, or our ability to deliver our services is interrupted, then our business and results of operations may be negatively impacted. See discussion of Legal contingencies and developments in Note 13 to the consolidated financial statements included in Part II, Item 8 of this Annual Report on Form 10-K.
We had approximately 929 shareholders of record as of January 28, 2011. We did not purchase any shares of our common stock under our authorized share purchase program during 2010 and 2009. Pursuant to our share purchase program, we purchased and retired 1.2 million shares of our common stock for a total of $16.0 million during 2008. Any future common stock repurchases are subject to the covenants of our lending facility, which may have the effect of restricting our ability to repurchase common stock. The table below includes purchases of our common stock pursuant to publicly announced plans or programs and those not made pursuant to publicly announced plans or programs during the fourteen weeks ended December 31, 2010. During the fourteen weeks ended December 31, 2010, we purchased 5,828 shares in order to satisfy employee tax withholding obligations upon the vesting of restricted stock. These shares were not acquired pursuant to any publicly announced purchase plan or program. Our Board of Directors authorized a $100 million share purchase program in April 2007 that does not have an expiration date. An additional $21.5 million may be purchased by us pursuant to this program. We did not purchase any shares of our common stock pursuant to this program during the fifty-three weeks ended December 31, 2010. The following graph depicts our stock price performance from December 31, 2005 through December 31, 2010, relative to the performance of the S&P Midcap 400 Index, and a peer group of companies in the temporary staffing industry. All indices shown in the graph have been reset to a base of 100 as of December 31, 2005, and assume an investment of $100 on that date and the reinvestment of dividends, if any, paid since that date. The peer group includes Kelly Services, Inc., Manpower, Inc., Volt Information Sciences, Inc., Spherion Corp. and Adecco SA. The following selected consolidated financial information has been derived from our audited Consolidated Financial Statements. The data should be read in conjunction with item 1A Risk Factors, Item 7 Managements Discussion and Analysis of Financial Condition and Results of Operations and our Consolidated Financial Statements and the notes included in Item 8 of this Annual Report on Form 10-K.
falling in our fourth fiscal quarter. All prior years presented included 52 weeks. TrueBlue, Inc. (TrueBlue, we, us, our) is a leading provider of temporary blue-collar staffing. The temporary staffing industry includes a number of markets focusing on business needs that vary widely in duration of assignment and level of technical specialization. We operate within the blue-collar staffing market of the temporary staffing industry. In 2010, we connected approximately 300,000 people to work through the following blue-collar staffing brands: Labor Ready for general labor, Spartan Staffing for light industrial services, CLP Resources for skilled trades, PlaneTechs for aviation and diesel mechanics and technicians, and Centerline for dedicated and temporary drivers. Headquartered in Tacoma, Washington, we serve approximately 175,000 businesses primarily in the services, construction, transportation, manufacturing, retail, and wholesale industries. As of December 31, 2010, we conducted our staffing services operations through 721 branch offices in all 50 states, Puerto Rico and Canada. Fiscal 2010 is a 53-week year ending on the last Friday in December. The final quarter of fiscal 2010 consists of 14 weeks. References to 2009 and 2008 relate to the 52-week fiscal years ended December 25, 2009 and December 26, 2008, respectively. Revenue grew to $1.15 billion for 2010, a 12.9% increase compared to the prior year. Excluding the 53rd week of 2010, revenue grew by 11.5% compared to 2009. The strong growth during 2010 was primarily driven by the economic recovery across most major geographies and significant industries we serve. Revenues associated with Boeing, our largest customer declined in 2010 as expected. Excluding the revenue associated with Boeing projects and the 53rd week of 2010, revenue increased 15.9% compared to 2009. Net income grew by 126% to $19.8 million or $0.46 per diluted share for fiscal 2010 as compared to $8.8 million or $0.20 per diluted share for fiscal 2009. We used our operating leverage to significantly improve our operating results. The improved operating leverage resulted from utilization of the excess capacity in our branch network and cost reduction actions taken in 2009 to support the revenue growth without an increase in expenses. During the recession we reduced our branch network and consolidated branch management, field management, and substantially all support services while preserving capacity to expand as the economy recovered. The additional week of revenue during 2010 was insignificant to our net income. Customer demand for blue-collar staffing services is dependent on the overall strength of the labor market and trends towards greater workforce flexibility within the blue-collar markets in which we operate. Improving economic growth typically results in increasing demand for labor, resulting in greater demand for our staffing services. During periods of increasing demand, we are able to improve our profitability by leveraging additional revenue and the associated gross profit across our fixed cost structure. Future growth trends will be dependent on whether the underlying economy continues to improve, trends in customer preference towards a more flexible workforce continue, and we are able to effectively serve customer needs. Given the uncertain nature of economic trends, it is not possible to predict when we will return to pre-recession levels of revenue and profitability. However, we do expect demand for our services to continue to grow during 2011. We are in a strong financial position to fund working capital needs for planned 2011 growth and expansion opportunities. We have cash and cash equivalents of $163 million at December 31, 2010, a 31% increase over the prior year. As of December 31, 2010, the maximum $80 million was available under the Revolving Credit Facility and $11 million of letters of credit have been issued against the facility, leaving an unused portion of $69 million. Revenue for 2010 increased 12.9% compared to 2009. Fiscal 2010 is a 53-week year. Excluding the 53rd week of 2010, revenue grew by 11.5% compared to 2009. The strong growth was primarily driven by the economic recovery across most geographies and significant industries we serve. Further, our customers continue to increase their use of a flexible workforce to meet the demands of the recovering economy. Revenue for 2009 decreased 26.4% compared to 2008. This decline was largely related to lower usage of our services as customers reduced their workforces in response to the economic recession. We began in 2008 to scale our cost structure to meet the declining demand for our services. Those efforts continued throughout 2009 and helped to ensure our continued profitability and put us in a strong position to face the challenges of the recession and increase profitability as the economy improved. Percentages for Organic Revenue Trends do not sum to total organic revenue growth / (decline) as same branch growth is determined off a revenue base of branches open for 12 or more months, whereas total Organic revenue growth is measured off a total revenue base. Same branch revenue is defined as those branches opened 12 months or more. New branches are defined as those branches opened less than 12 months. Represents the impact on revenue trends from closed branches assuming no customer retention. The majority of our closed branches are consolidated with another branch to retain customer relationships. The impact of retained customers is captured in same branch revenue. Represents revenue growth as a result of an additional week in the year ended December 31, 2010 in comparison with the same period in the prior years. Excluded impact of 53rd week in order to compare to prior years on a same-week basis. The improvement of our year-over-year quarterly same branch revenue trends for 2010 was due primarily to the economic recovery which was partially offset by the anticipated decline in work associated with Boeing projects. Excluding the impact of the revenue associated with Boeing and the extra week in the fourth quarter of 2010, same branch revenue growth would have been 2.9% for the first quarter, 23.1% for the second quarter, 22.6% for the third quarter, and 25.4% for the fourth quarter of 2010. Gross profit as a percentage of revenue for fiscal 2010 declined as compared to fiscal 2009. The decline is primarily due to revenue mix, increased costs associated with our temporary workers, and higher workers compensation expense. The impact on gross profit from revenue mix is related to two primary factors. First, brands with a lower gross margin as a percent of revenue which specialize in manufacturing and industrial activities have become a larger portion of our business during the recession and the subsequent recovery. Second, our mix of blue-collar staffing business has shifted to service more national and large industrial customers which remained stronger than small to medium sized business during the recession and early stages of the recovery. These national and large industrial customers have put increased pricing pressure on our gross margins. The increased cost of our temporary workers results primarily from increased state unemployment taxes and certain other payroll taxes. The unemployment tax increases have in part been passed through to our customers. However, in most cases, the pass through did not include our standard markup. Increased cost of our temporary workers was partially offset by the incentives from the Hiring Incentives to Restore Employment (HIRE) Act which was enacted in March of 2010. The HIRE Act provided incentives for hiring and retaining workers by exempting the employer share of the social security tax on wages paid to qualified individuals beginning on March 18, 2010 and expired on December 31, 2010. We recognized $1.9 million of HIRE Act incentives net of other non-recurring payroll tax expense in 2010. Workers compensation expense was 3.8% of revenue for 2010 versus 3.1% of revenue for 2009. The actual settlement cost of workers compensation claims continues to be less than previously estimated due primarily to the success of our risk management programs. The success of these programs has resulted in reducing prior estimated claim settlement costs. However, those reductions were less in 2010 as compared to 2009 resulting in increased workers compensation expense as a percent of revenue. The decline in gross profit as a percentage of revenue for 2009 as compared to 2008 is primarily due to pricing pressures, increased statutory minimum wages, and revenue mix. The pricing pressure was due largely to increased price competition as a result of the recession. Our customers requested bill rate decreases and new customers also requested lower bill rates in comparison with historical bill rates. Statutory minimum wages paid to our temporary workers increased in 43 states as well as in Canada during 2009. While we increased the bill rates to our customers for pay increases, we did not fully pass through the amount of our standard markup due to our customers heightened level of price sensitivity related to slower economic conditions. Workers compensation expense as a percentage of revenue for 2009 was approximately 3.1% compared to 4.1% for 2008, which helped offset the negative impact from minimum wage increases and the drop in construction-related revenue which generally produced a higher gross margin in comparison with the blended, overall gross margin of the company. The improvement in workers compensation expense was due primarily to the continued success of our accident prevention and risk management programs that have been implemented over several years. The decline in SG&A as a percentage of revenue for 2010 was the result of increased revenues without a corresponding increase to SG&A. During periods of increasing demand, we are able to improve our profitability and operating leverage as our current cost base can support some increases in business without a similar increase in SG&A. The decrease in SG&A during 2010 was also due to a combination of cost reduction actions in 2009 and aggressive cost containment in 2010. We remain focused on leveraging our existing network of branches and support services which will produce a strong incremental operating margin as we continue to leverage our fixed cost structure. SG&A expenses declined by 1.3% and 21.0% for 2010 and 2009, respectively, in comparison with the prior year. The decrease in 2009 as compared to 2008 is largely the result of the aggressive cost management actions taken across the organization in 2009 in response to the recession, which included the consolidation of branches, branch management, field management, and substantially all back office support activities, as well as the reduction of various program expenses. In the fourth quarter of 2008, we experienced a significant decline in our stock price. As a result of this decline, our market capitalization fell significantly below the recorded value of our consolidated net assets. The reduced market capitalization reflected, in part, the economic climate at the time, as well as expected continued weakness in pricing and demand for our temporary staffing services. As a result of our 2008 assessment, we concluded that the carrying amounts of goodwill and indefinite-lived intangible assets for the CLP, Spartan Staffing, and Centerline reporting units exceeded their implied fair values and we recorded non-cash impairment losses totaling $61.0 million, which was reflected in our Consolidated Statements of Operations for the fiscal year ended December 26, 2008. Our assessment of goodwill and indefinite-lived intangible assets impairment indicated that as of December 26, 2008, the fair value of each of the Labor Ready and PlaneTechs reporting units exceeded its carrying value and therefore goodwill was not impaired. Depreciation and amortization decreased for fiscal 2010 as compared to 2009 by $0.5 million from reduced capital spending and a decrease in amortization of intangible assets which have become fully amortized. Depreciation increased for fiscal 2009 as compared to 2008 by $4.1 million resulting primarily from investments in technology to improve branch and branch support efficiencies. The increase was largely offset by $3.8 million of decreased amortization of intangible assets as a result of their impairment in fiscal 2008. Net interest income has declined over the past three years due to a continued decline in investment yields on our restricted and unrestricted cash. Our effective income tax rate was 32.0% in 2010, as compared to 37.8% in 2009 and 151.0% in 2008. Excluding the impairment of goodwill and intangible assets in 2008, our effective income tax rate in 2008 would have been 34.7%. The principal difference between the statutory federal income tax rate of 35.0% and our 2010 effective income tax rate results from state and foreign income taxes, federal tax credits, and certain non-deductible expenses. Our 2010 effective tax rate of 32.0% was lower than our 2009 rate of 37.8% primarily due to the tax benefit related to the favorable development of a federal income tax matter. Our 2008 effective tax rate of 34.7% excluding the effect of the impairment charge was lower than our 2009 rate primarily due to the favorable resolution of certain state income tax matters during 2008. Due to our industrys sensitivity to economic factors, the inherent difficulty in forecasting the direction and strength of the economy, and the short term nature of staffing assignments, our visibility for future demand is limited. As a result, we monitor a number of economic indicators as well as certain trends to estimate future revenue trends. Based on these anticipated trends, we expect continued revenue growth in 2011 as the economy continues to recover. However, our revenue growth percentage will diminish due to more challenging prior period revenue comparisons versus the prior period comparables for 2010. Our expected revenue growth will be partially offset by reduced revenue associated with our largest customer as they complete certain multi-year projects. Revenue associated with Boeing projects in 2010 was $113 million and our expectation for the first quarter of 2011 is $20 million which is our best estimate for expected revenue in future quarters. Fiscal 2011 will be a 52-week year as compared to fiscal 2010 which was a 53-week year. The extra week in 2010 added approximately $14 million to 2010 revenue which will negatively impact our growth rate comparisons for 2011 versus 2010. Our top priority is increasing revenue through our existing branch network and improving gross margin. This will continue to produce strong incremental operating margins as we leverage our fixed cost structure across additional organic revenue. We will continue to invest in our sales and customer service programs which we believe will enhance our ability to capitalize on further growth and customer retention. While we do incur additional SG&A costs to support additional organic revenue, we will continue to diligently manage our cost structure to meet our goal of producing a strong incremental operating margin on additional organic revenue. As the economy grows, we will continue to evaluate opportunities to expand our market presence. All of our multi-location brands have opportunities to expand through new physical locations or by sharing existing locations. Where possible we plan to expand the presence of our brands by sharing existing locations to achieve cost synergies. We plan to build on our success with centralized recruitment and dispatch of our temporary workers to locations without physical branches and expand our geographic reach. We will also evaluate strategic acquisitions in the blue-collar staffing market that can produce strong returns on investment. Our focus is on acquisitions that can accelerate the building of a national presence for a particular brand or that provide an opportunity to serve a new, but sizable portion of the blue-collar staffing market. Federal and state unemployment taxes will increase again in 2011. Our best estimate of the impact, assuming no action on our part, is an increase that would negatively impact gross margin by 0.6% of revenue. We have put in place programs to pass these costs through to our customers. Until the economy fully recovers and state unemployment funds have been replenished and related federal loans repaid by certain states, we expect continued increases to our unemployment taxes and our customers could be resistant to price increases to cover these costs. We have certain non-recurring benefits to our gross margin in 2010. The benefits from the HIRE Act for hiring and retaining workers who qualify for certain payroll tax exemptions expired in 2010. The benefit of this non-recurring program net of other non-recurring payroll tax expense was $1.9 million or nearly 20 basis points of gross margin in 2010. Likewise, our workers compensation expense as a percentage of revenue has been running at approximately 4% during the second half of 2010, which we believe is a reasonable expectation for 2011. During the first half of 2010, our workers compensation expense was less than 4% of revenue which contributed to our workers compensation expense for fiscal year 2010 of approximately 3.8%, or 0.2% of revenue less than our current run rate. Starting in 2011, we will report our organic revenue trends without reference to revenue by branch, which is consistent with our industry. Given our objective of leveraging our existing branch network, increasing our focus on centralized activities, sharing branch offices, and a variety of other factors, we believe reporting revenue as a function of branch count is no longer meaningful. Our principal source of liquidity is operating cash flows. Our net income and, consequently, our cash provided from operations are impacted by sales volume, seasonal sales patterns and profit margins. Over the past three fiscal years, net cash provided by operations was approximately $168 million. Net income for 2010 was $19.8 million as compared to $8.8 million for 2009 due to the recovering economy. Net income was lower in 2009 and 2008 due to the recession. Results for 2008 include a goodwill and intangible asset impairment charge of $61.0 million related to the companys acquisitions since 2004. Excluding this impairment charge, net income would have been $45.2 million. The charge is largely a result of the adverse impact on expected future cash flows related to the global recession. The charge did not impact the companys cash, liquidity, or compliance with banking covenants. Accounts receivable increased in 2010 primarily due to revenue growth which was partially offset by improved collections and a decrease in our days sales outstanding. The provision for doubtful accounts declined in 2010 and reflects the improving economy and ability of our customers to pay. Accounts receivable increased in 2009 due to recession and customers extending their payment cycle. The provision for doubtful accounts for 2009 increased as a result of the recession and inability of some customers to pay. The change in income taxes during 2009 is primarily due to tax refunds claimed in 2008 and received in 2009. Generally, our workers compensation reserve for estimated claims increases as temporary labor services increase and decreases as temporary labor services decline. During 2010, our workers compensation reserve increased as we increased temporary labor services offset by the timing of payments. During 2009, the estimated claims decreased as we decreased temporary labor services due to the recession. Changes in accounts payable and accrued expenses during 2010 are primarily due to increased accrued payroll taxes associated with increased revenue as a result of the economic recovery and corresponding increases to temporary labor payroll expense, as well as increased unemployment tax rates for 2010 partially offset by HIRE Act incentives recognized for hiring and retaining workers who qualify for certain payroll tax exemptions. Conversely during 2009, accounts payable and accrued expenses decreased due to cost control measures, the decline in payroll expense and our response to the economic recession. Capital expenditures in 2010, 2009 and 2008 were primarily due to significant investments made to upgrade our proprietary information systems. We anticipate that total capital expenditures will be approximately $8 million in 2011. We held no marketable securities as of year end December 26, 2008 and made no investments in marketable securities during the 2009 and 2010 fiscal years. We had net maturities of marketable securities in 2008. Acquisitions of businesses, net of cash acquired, included the purchase of two entities. In March 2008, we purchased substantially all of the assets of TLC, a skilled truck-driver staffing provider, for $5.4 million. In April 2008, we purchased PMI, an industrial staffing provider, for $17.0 million. We are required by our insurance carriers to collateralize a portion of our workers compensation obligation with cash and cash-backed instruments, letters of credit, or surety bonds. During 2010, our insurance carriers released and refunded $6.3 million of our collateral. Total collateral decreased for 2009. However, the mix of restricted cash and letters of credit changed resulting in an increase to restricted cash and a decrease to letters of credit. We purchased and retired 1.2 million shares of our common stock in 2008. We have Cash and cash equivalents of $163 million as of December 31, 2010. This is an increase of $39 million over the prior year. Our borrowing availability under our credit facility is principally based on accounts receivable and the value of our corporate building. We have $69 million of borrowing available under our credit facility as of December 31, 2010. We believe the credit facility provides adequate borrowing availability. The majority of our workers compensation payments are made from restricted cash versus cash from operations. At December 31, 2010, approximately two-thirds of our workers compensation reserve was covered by restricted cash. On July 22, 2009, we filed a $100 million Shelf Registration Statement with the Securities and Exchange Commission, which allows us to sell various securities in amounts and prices determined at the time of sale. The filing enables us to access capital efficiently and quickly if needed pending current market conditions. As the economy continues to recover, we will continue to aggressively control costs, limit new branch openings and tightly control capital expenditures. We believe that cash provided from operations and our capital resources will be adequate to meet our cash requirements over the next twelve months. However, should economic conditions again deteriorate, our financial results would be adversely impacted and we may need to seek additional sources of capital. These additional sources of financing may not be available, or may not be available on commercially reasonable terms. On June 22, 2009, we entered into a credit agreement with Wells Fargo Foothill, LLC and Bank of America, N.A., for a secured revolving credit facility of up to a maximum of $80 million (the Revolving Credit Facility). The Revolving Credit Facility, which expires in June 2012, replaced our previous $80 million revolving credit facility with Wells Fargo Bank, N.A. and Bank of America, N.A., which was set to expire in April of 2011. As of December 31, 2010, the maximum $80 million was available under the Revolving Credit Facility and $11 million of letters of credit have been issued against the facility, leaving an unused portion of $69 million. Less other reserves if deemed applicable. The unused portion of the Revolving Credit Facility at an annual rate of 0.375%. The Revolving Credit Facility requires that we maintain liquidity in excess of $30 million. We are required to satisfy a fixed charge coverage ratio in the event that liquidity falls below $30 million. The liquidity level is defined as the amount we are entitled to borrow as advances under the Revolving Credit Facility plus the amount of cash and cash equivalents held in accounts subject to a control agreement benefiting the lenders. The amount we were entitled to borrow at December 31, 2010 was $69 million and the amount of cash and cash equivalents under control agreements was $159 million for a total of $228 million, which was well in excess of our $30 million liquidity requirement. We are currently in compliance with all covenants related to the Revolving Credit Facility. The Revolving Credit Facility limits the amount of our common stock we can purchase to $10 million during any twelve month period and the aggregate of cash dividends we pay cannot exceed $5 million over the life of the facility, unless we obtain consent from our lenders to increase these amounts. Obligations under the Revolving Credit Facility are secured by substantially all of our domestic personal property and our headquarters located in Tacoma, Washington. We have agreements with certain financial institutions that allow us to restrict cash for the purpose of providing cash-backed instruments to our insurance carriers to satisfy workers compensation collateral needs. These instruments include cash-backed letters of credit, cash-backed bonds, cash held in trusts, as well as cash deposits held by our insurance carriers. At December 31, 2010, we had restricted cash held primarily by our insurance carriers totaling $120 million. The majority of our collateral is held by Chartis, formerly known as AIU Holdings, Inc., a subsidiary of American International Group, Inc. Included in cash and cash equivalents at December 31, 2010 and December 25, 2009 is cash held within branch cash dispensing machines (CDMs) for payment of temporary payrolls in the amount of $6.7 million and $8.9 million, respectively. We believe that cash provided from operations and our capital resources will be adequate to meet our cash requirements over the next twelve months. However, should economic conditions deteriorate, our financial results would be adversely impacted and we may need to seek additional sources of capital. These additional sources of financing may not be available, or may not be available on commercially reasonable terms. We provide workers compensation insurance for our temporary and permanent employees. The majority of our current workers compensation insurance policies cover claims for a particular event above a $2.0 million deductible limit, on a per occurrence basis. This results in our being substantially self-insured. Our workers compensation reserve is established using estimates of the future cost of claims and related expenses, which are discounted to their estimated net present value. The discounted workers compensation claims reserve was $187.3 million at December 31, 2010. The following table provides an analysis of changes in our workers compensation claims reserves (in millions). The majority of our current workers compensation insurance policies cover claims for a particular event above a $2.0 million deductible limit, on a per occurrence basis. However, we have full liability for all remaining payments on claims that originated between January 2001 and June 2003, without recourse to any third party insurer as the result of a novation agreement we entered into with Kemper Insurance Company in December 2004. Prior to 2001, we were insured by various carriers who are now insolvent and as a result we are substantially reserved for any claims above the self-insurance limit. Our workers compensation claims reserves are discounted to their estimated net present value using discount rates based on returns of risk-free U.S. Treasury instruments with maturities comparable to the weighted average lives of our workers compensation claims. At December 31, 2010, the weighted average rate was 3.3%. Claim payments. Payments are made against claims for the current year as well as all prior years for which claims remain open. The claim payments are made over a weighted average period of approximately 5.5 years. Changes to prior years self-insurance reserve, net of discount. Changes in reserve estimates are reflected in the income statement in the period when the changes in estimates are made. Changes related to prior years reserves (net of discount) resulted in decreases in our reserves of $17.1 million, $23.0 million, and $21.0 million for 2010, 2009 and 2008, respectively. Amortization of prior years discount. Changes to the estimated weighted average lives and corresponding discount rates for actual payments made are reflected in the income statement in the period when the changes in estimates are made. Increases related to prior years resulted in increases in our reserves of $4.6 million, $7.4 million and $2.1 million for 2010, 2009 and 2008, respectively. its respective estimated net present value using the risk-free rates associated with the actuarially determined weighted average lives of our excess claims. At December 31, 2010, the weighted average rate was 5.1%. The claim payments are made and the corresponding reimbursements from our insurance carriers are received over a weighted average period of approximately 19.5 years. When appropriate, based on our best estimate, we record a valuation allowance against the insurance receivable to reflect amounts that may not be realized from insurance companies that are insolvent. Two of the workers compensation insurance companies (Troubled Insurance Companies) with which we formerly did business are in liquidation and have failed to pay a number of excess claims to date. These excess claims have been presented to the state guaranty funds of the states in which the claims originated. Some of these excess claims have been rejected by the state guaranty funds due to statutory eligibility limitations. Receivables from Troubled Insurance Companies, were $8 million, $8 million and $9 million as of December 31, 2010, December 25, 2009 and December 26, 2008, respectively. Our valuation allowance against these receivables as of December 31, 2010, December 25, 2009 and December 26, 2008 was $8 million, $7 million and $7 million, respectively. Changes to the valuation allowance are recorded in the income statement in the period in which the changes are made. Liability assumed from acquired business, net of discount. We assumed the workers compensation reserve related to our acquisition of PMI in 2008. While we have primary responsibility for all claims, our insurance coverage provides reimbursement for certain losses and expenses beyond our deductible limits. Our workers compensation insurance policies are renewed annually. We had coverage with Chartis for occurrences during the period from July 2009 to July 2010 and renewed our coverage with Chartis effective July 2010 to July 2011. We are also self-insured with certain state workers compensation programs, which are typically renewed on an annual basis. Our insurance carriers and certain state workers compensation programs require us to collateralize a portion of our workers compensation obligation, for which they become responsible should we become insolvent. The collateral typically takes the form of cash and cash-backed instruments, letters of credit, and/or surety bonds. On a regular basis these entities assess the amount of collateral they will require from us relative to our workers compensation obligation. Such amounts can increase or decrease independent of our assessments and reserves. We generally anticipate that our collateral obligations will continue to grow. We pay our premiums and deposit our collateral in installments. Chartis holds the majority of the restricted cash collateralizing our self-insured workers compensation policies. Our claims reserves are discounted to their estimated net present value while our collateral commitments are based on the gross, undiscounted reserve. Collateral posted with the current insurance carrier and various state entities in comparison to the estimated balance of unpaid claims. to claims above our deductible limits. (1) We had $4.1 and $6.6 million of restricted cash collateralizing our letters of credit at December 31, 2010 and December 25, 2009, respectively. (2) We had $3.0 and $3.8 million of restricted cash collateralizing our surety bonds at December 31, 2010 and December 25, 2009, respectively. We typically earn interest income on the cash collateral held by insurance carriers. We have agreements with certain financial institutions to issue letters of credit on our behalf under the Revolving Credit Facility. Our surety bonds are issued by independent insurance companies on our behalf and bear annual fees based on a percentage of the bond, which is determined by each independent surety carrier, but do not exceed 2.0% of the bond amount, subject to a minimum charge. The terms of these bonds are subject to review and renewal every one to four years and most bonds can be canceled by the sureties with as little as 60 days notice. We have various contractual obligations that are recorded as liabilities in our consolidated financial statements. Certain contractual obligations, such as operating leases, are not recognized as liabilities in our consolidated financial statements, but are required to be disclosed. There were no material changes outside the ordinary course of business in our contractual obligations during 2010. The following table provides a summary of our contractual obligations as of the end of fiscal 2010. We expect to fund these commitments with existing cash and cash equivalents, and cash flows from operations. Excludes all payments related to branch leases cancelable within 90 days. Primarily payments on communication equipment. Liability for unrecognized tax benefits. Managements Discussion and Analysis of Financial Condition and Results of Operations discusses our consolidated financial statements, which have been prepared in accordance with accounting principles generally accepted in the United States of America (U.S. GAAP). The preparation of these financial statements requires management to make estimates and assumptions that affect the reported amounts of assets and liabilities and the disclosure of contingent assets and liabilities at the date of the consolidated financial statements and the reported amounts of revenue and expenses during the reporting period. On an on-going basis, management evaluates its estimates and judgments. Management bases its estimates and judgments on historical experience and on various other factors that are believed to be reasonable under the circumstances, the results of which form the basis for making judgments about the carrying value of assets and liabilities that are not readily apparent from other sources. Actual results may differ from these estimates under different assumptions or conditions. Management believes that the following accounting estimates are the most critical to aid in fully understanding and evaluating our reported financial results, and they require managements most difficult, subjective or complex judgments, resulting from the need to make estimates about the effect of matters that are inherently uncertain. the year and make adjustments accordingly. If the actual cost of such claims and related expenses exceeds the amounts estimated, additional reserves may be required. Changes in reserve estimates are reflected in the income statement in the period when the changes in estimates are made. Our workers compensation reserves include estimated expenses related to claims above our self-insured limits (excess claims) and a corresponding receivable for the insurance coverage on excess claims based on the contractual policy agreements we have with insurance companies. We discount the reserve and its corresponding receivable to its respective estimated net present value using the risk-free rates associated with the actuarially determined weighted average lives of our excess claims. When appropriate, based on our best estimate, we record a valuation allowance against the insurance receivable to reflect amounts that may not be realized. There are two main factors that impact workers compensation expense: the number of claims and the cost per claim. The number of claims is driven by the volume of hours worked, the business mix which reflects the type of work performed, and the safety of the environment where the work is performed. The cost per claim is driven primarily by the severity of the injury, the state in which the injury occurs, related medical costs and lost-time wage costs. A 10% change in the number of claims or cost per claim would impact workers compensation expense by approximately $4.7 million. We have not had significant changes in the assumptions used in calculating our reserve balance. However, our reserve balances have been positively impacted primarily by the success of our accident prevention programs. In the event that we are not able to further reduce our accident rates, the positive impacts to our reserve balance will diminish. Under various plans, officers, employees and non-employee directors have received or may receive grants of stock, stock units, or options to purchase common stock. Compensation expense for restricted stock and stock units is generally recognized on a straight-line basis over the vesting period, based on the stocks fair market value on the grant date. For restricted stock grants issued with performance conditions, compensation expense is recognized over each vesting tranche. We recognize compensation expense for only the portion of restricted stock and stock units that is expected to vest, rather than record forfeitures when they occur. If the actual number of forfeitures differs from those estimated by management, additional adjustments to compensation expense may be required in the future periods. We determine the fair value of options to purchase common stock using the Black-Scholes valuation model, which requires the input of subjective assumptions. We recognize expense over the service period for options that are expected to vest and record adjustments to compensation expense at the end of the service period if actual forfeitures differ from original estimates. Based on an analysis using changes in certain assumptions that could be reasonably possible in the near term, management believes the effect on the expense recognized for fiscal 2010 would not have been material. We establish an allowance for doubtful accounts for estimated losses resulting from the failure of our customers to make required payments. The allowance for doubtful accounts is determined based on historical write-off experience and current economic data and represents our best estimate of the amount of probable credit losses. The allowance for doubtful accounts is reviewed quarterly and past due balances are written-off when it is probable the receivable will not be collected. If the financial condition of our customers were to deteriorate, resulting in an impairment of their ability to make payments, additional allowances may be required. Goodwill is the excess of the purchase price over the fair value of identifiable net assets acquired in business combinations. We do not amortize goodwill but test it for impairment annually in the fiscal fourth quarter, or when indications of potential impairment exist. We monitor the existence of potential impairment indicators throughout the fiscal year. goodwill. If the carrying value of the reporting units goodwill exceeds the implied fair value of the goodwill, we recognize an impairment loss in an amount equal to the excess, not to exceed the carrying value. We determine the fair value of each reporting unit primarily using a discounted cash flow model. Based on our test, the fair market value of our reporting units was substantially greater than net book value. We also use comparable market earnings multiple data and our companys market capitalization to corroborate our reporting unit valuations. We base fair value estimates on assumptions we believe to be reasonable but that are unpredictable and inherently uncertain. Actual future results may differ from those estimates. From time to time we are subject to compliance audits by federal, state, and local authorities relating to a variety of regulations including wage and hour laws, taxes, workers compensation, immigration, and safety. From time to time we are also subject to legal proceedings in the ordinary course of our operations. We have established reserves for contingent legal and regulatory liabilities. We record a liability when our management judges that it is probable that a legal claim will result in an adverse outcome and the amount of liability can be reasonably estimated. To the extent that an insurance company is contractually obligated to reimburse us for a liability, we record a receivable for the amount of the probable reimbursement. We evaluate our reserve regularly throughout the year and make adjustments as needed. If the actual outcome of these matters is different than expected, an adjustment is charged or credited to expense in the period the outcome occurs or the period in which the estimate changes. We account for income taxes by recording taxes payable or refundable for the current year and deferred tax assets and liabilities for the future tax consequences of events that have been recognized in our financial statements or tax returns. We measure these expected future tax consequences based upon the provisions of tax law as currently enacted; the effects of future changes in tax laws are not anticipated. Future tax law changes, such as changes to federal and state corporate tax rates and the mix of states and their taxable income, could have a material impact on our financial condition or results of operations. When appropriate, we record a valuation allowance against deferred tax assets to offset future tax benefits that may not be realized. In determining whether a valuation allowance is appropriate, we consider whether it is more likely than not that all or some portion of our deferred tax assets will not be realized, based in part upon managements judgments regarding future events and past operating results. We are exposed to market risk related to changes in interest rates and foreign currency exchange rates, each of which could adversely affect the value of our investments. We do not currently use derivative financial instruments. As of December 31, 2010, our purchased investments included in cash and cash equivalents had maturities of less than 90 days. Therefore, an increase or decrease in interest rates immediately and uniformly by 10% from our 2010 year end levels would not have a material effect upon our cash and cash equivalent balances, operating results or cash flows. We have audited the accompanying consolidated balance sheets of TrueBlue, Inc. and subsidiaries (the Company) as of December 31, 2010 and December 25, 2009, and the related consolidated statements of operations, shareholders equity and comprehensive income (loss), and cash flows for each of the two fiscal years then ended. Our audits also included the financial statement schedules listed in the index at Item 15(a)2 as of and for the fiscal years ended December 31, 2010 and December 25, 2009. These financial statements and financial statement schedules are the responsibility of the Companys management. Our responsibility is to express an opinion on these financial statements and financial statement schedules based on our audits. In our opinion, such consolidated financial statements present fairly, in all material respects, the financial position of TrueBlue, Inc. and subsidiaries as of December 31, 2010 and December 25, 2009, and the results of their operations and their cash flows for each of the two fiscal years then ended in conformity with accounting principles generally accepted in the United States of America. Also, in our opinion, such financial statement schedules for the fiscal years ended December 31, 2010 and December 25, 2009, when considered in relation to the basic consolidated financial statements taken as a whole, presents fairly, in all material respects, the information set forth therein. We have also audited, in accordance with the standards of the Public Company Accounting Oversight Board (United States), the Companys internal control over financial reporting as of December 31, 2010, based on the criteria established in Internal Control  Integrated Framework issued by the Committee of Sponsoring Organizations of the Treadway Commission and our report dated February 22, 2011 expressed an unqualified opinion on the Companys internal control over financial reporting. 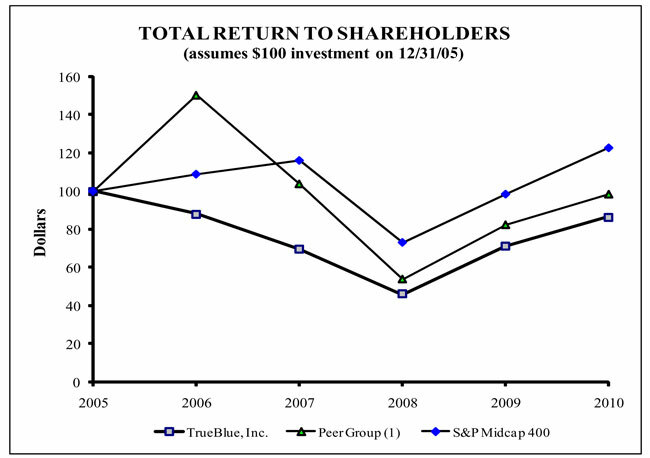 In our opinion, the consolidated balance sheet as of December 26, 2008 and the related consolidated statements of operations, of shareholders' equity and comprehensive income (loss) and of cash flows for the period ended December 26, 2008 present fairly, in all material respects, the financial position of TrueBlue, Inc. and its subsidiaries at December 26, 2008, and the results of their operations and their cash flows for the period ended December 26, 2008, in conformity with accounting principles generally accepted in the United States of America. In addition, in our opinion, the financial statement schedule appearing under Item 15 for the period ended December 26, 2008 presents fairly, in all material respects, the information set forth therein when read in conjunction with the related consolidated financial statements. These financial statements and financial statement schedule are the responsibility of the Company's management. Our responsibility is to express an opinion on these financial statements and financial statement schedule based on our audit. We conducted our audit of these statements in accordance with the standards of the Public Company Accounting Oversight Board (United States). Those standards require that we plan and perform the audit to obtain reasonable assurance about whether the financial statements are free of material misstatement. An audit includes examining, on a test basis, evidence supporting the amounts and disclosures in the financial statements, assessing the accounting principles used and significant estimates made by management, and evaluating the overall financial statement presentation. We believe that our audit provides a reasonable basis for our opinion. TrueBlue, Inc. (TrueBlue, we, us, our) provides temporary blue-collar staffing services through the following brands: Labor Ready for general labor, Spartan Staffing for light industrial services, CLP Resources for skilled trades, PlaneTechs for aviation and diesel mechanics and technicians, and Centerline for dedicated and temporary drivers. We are a leader in blue-collar staffing services and through our brands we provide a wide range of specialized staffing services to our customers. We began operations in 1989 under the name Labor Ready, Inc. providing on-demand, general labor staffing services. Starting in 2004, we began acquiring additional brands to expand our service offerings to customers in the blue-collar staffing market. Effective December 18, 2007, Labor Ready, Inc. changed its name to TrueBlue, Inc. The name change reflects our vision to be the leading provider of blue-collar staffing with multiple brands serving the temporary staffing industry. We are headquartered in Tacoma, Washington. The consolidated financial statements include the accounts of TrueBlue, Inc. and all of its wholly-owned subsidiaries. All significant intercompany balances and transactions have been eliminated in consolidation. The consolidated financial statements and accompanying notes are prepared in accordance with accounting principles generally accepted in the United States of America (U.S. GAAP). Our international operations are not significant to our total operations for segment reporting purposes. Total revenues from our international operations were 3.8%, 3.3% and 5.5% of our total revenue for fiscal years ending 2010, 2009 and 2008, respectively. Our fiscal year ends on the last Friday of December. Fiscal 2010 included 53 weeks ended December 31, 2010. Fiscal 2009 and 2008 each included 52 weeks ended December 25, 2009 and December 26, 2008, respectively. In fiscal years consisting of 53 weeks, the final quarter will consist of 14 weeks while in 52-week years all quarters will consist of 13 weeks. Preparing financial statements in conformity with U.S. GAAP requires management to make estimates and assumptions that affect the reported amounts of assets, liabilities, revenues and expenses. Examples include, but are not limited to, allowance for doubtful accounts, estimates for asset and goodwill impairments, stock-based compensation forfeiture rates, assumptions underlying self-insurance reserves, and the potential outcome of future tax consequences of events that have been recognized in the financial statements. Actual results and outcomes may differ from these estimates and assumptions. Cost of services primarily includes wages of temporary workers and related payroll taxes and workers compensation expenses. Cost of services also includes billable travel and other reimbursable costs. Advertising costs consist primarily of print and other promotional activities. We expense advertisements as of the first date the advertisements take place. Advertising expenses included in selling, general and administrative expenses were $3.3 million in 2010, $3.0 million in 2009 and $5.2 million in 2008. Accounts receivable are recorded at the invoiced amount together with interest for certain past due accounts. We establish an allowance for doubtful accounts for estimated losses resulting from the failure of our customers to make required payments. The allowance for doubtful accounts is determined based on historical collection trends, write-off experience, customer credit risk, and current economic data and represents our best estimate of the amount of probable credit losses. The allowance for doubtful accounts is reviewed quarterly and past due balances are written-off when it is probable the receivable will not be collected. Our allowance for doubtful accounts was $6.4 million and $6.6 million as of December 31, 2010 and December 25, 2009, respectively. Cash pledged as collateral or restricted to use for workers' compensation insurance programs is included as restricted cash in our consolidated balance sheet. Property under capital lease is comprised of equipment used in our operations and corporate support functions. The related depreciation for capital lease assets is included in depreciation expense. We also lease certain equipment under non-cancelable operating and capital leases. Assets acquired under capital leases are depreciated over the shorter of the useful life of the asset or the lease term, including renewal periods, if reasonably assured. We test for goodwill impairment at the reporting unit level. We consider our brands Labor Ready, Spartan Staffing, CLP Resources, PlaneTechs and Centerline to be reporting units for goodwill impairment testing. In fiscal 2010, 2009 and 2008, there were no material changes to our reporting units other than new reporting units created as a result of acquisitions in 2008. The impairment test involves comparing the fair value of each reporting unit to its carrying value, including goodwill. Fair value reflects the price a market participant would be willing to pay in a potential sale of the reporting unit. If the fair value exceeds carrying value, then we conclude that no goodwill impairment has occurred. If the carrying value of the reporting unit exceeds its fair value, a second step is required to measure possible goodwill impairment loss. The second step includes hypothetically valuing the tangible and intangible assets and liabilities of the reporting unit as if the reporting unit had been acquired in a business combination. Then, the implied fair value of the reporting unit's goodwill is compared to the carrying value of that goodwill. If the carrying value of the reporting unit's goodwill exceeds the implied fair value of the goodwill, we recognize an impairment loss in an amount equal to the excess, not to exceed the carrying value. We determine the fair value of each reporting unit using a discounted cash flow model. We routinely evaluate our branch network and close under-performing branches. We classify closed branches in discontinued operations when the operations and cash flows of the branch have been or will be eliminated from ongoing operations. To determine if cash flows have been or will be eliminated from ongoing operations, we evaluate a number of qualitative and quantitative factors, including, but not limited to, proximity to remaining open branches and estimates of revenue migration from the closed branch to any branch remaining open. The estimated revenue migration is based on historical estimates of our revenue migration upon opening or closing a branch in a similar market. Branch closings meeting the criteria for discontinued operations were not material individually or cumulatively for any reporting year presented. Assets related to planned branch closures or other exit activities are evaluated for impairment in accordance with our impairment policy, giving consideration to revised estimates of future cash flows. We maintain reserves for workers compensation claims using actuarial estimates of the future cost of claims and related expenses. These estimates include claims that have been reported but not settled and claims that have been incurred but not reported. These reserves, which reflect potential liabilities to be paid in future periods based on estimated payment patterns, are discounted to estimated net present value using discount rates based on average returns of risk-free U.S. Treasury instruments, which are evaluated on a quarterly basis. We evaluate the reserves regularly throughout the year and make adjustments accordingly. If the actual cost of such claims and related expenses exceeds the amounts estimated, additional reserves may be required. Changes in reserve estimates are reflected in the income statement in the period when the changes in estimates are made. Our workers compensation reserves include estimated expenses related to claims above our self-insured limits (excess claims) and a corresponding receivable for the insurance coverage on excess claims based on the contractual policy agreements we have with insurance companies. We discount the liability and its corresponding receivable to its estimated net present value using the risk-free rates associated with the actuarially determined weighted average lives of our excess claims. When appropriate, based on our best estimate, we record a valuation allowance against the insurance receivable to reflect amounts that may not be realized. From time to time we are subject to compliance audits by federal, state and local authorities relating to a variety of regulations including wage and hour laws, taxes, workers compensation, immigration and safety. From time to time we are also subject to legal proceedings in the ordinary course of our operations. We have established reserves for contingent legal and regulatory liabilities. We record a liability when our management judges that it is probable that a legal claim will result in an adverse outcome and the amount of liability can be reasonably estimated. To the extent that an insurance company is contractually obligated to reimburse us for a liability, we record a receivable for the amount of the probable reimbursement. We evaluate our reserve regularly throughout the year and make adjustments as needed. If the actual outcome of these matters is different than expected, an adjustment is charged or credited to expense in the period the outcome occurs or the period in which the estimate changes. We account for income taxes by recording taxes payable or receivable for the current year and deferred tax assets and liabilities for the future tax consequences of events that have been recognized in our financial statements or tax returns. These expected future tax consequences are measured based on provisions of tax law as currently enacted; the effects of future changes in tax laws are not anticipated. Future tax law changes, such as changes to the federal and state corporate tax rates and the mix of states and their taxable income, could have a material impact on our financial condition or results of operations. When appropriate, we record a valuation allowance against deferred tax assets to offset future tax benefits that may not be realized. In determining whether a valuation allowance is appropriate, we consider whether it is more likely than not that all or some portion of our deferred tax assets will not be realized, based in part upon managements judgments regarding future events and past operating results. Based on that analysis, we have determined that a valuation allowance is appropriate for certain foreign net operating losses that we expect will not be utilized within the permitted carry forward periods as of December 31, 2010 and December 25, 2009. See Note 11 for further discussion. Under various plans, officers, employees and non-employee directors have received or may receive grants of stock, stock units, or options to purchase common stock. We also have an employee stock purchase plan (ESPP). Compensation expense for restricted stock and stock units is generally recognized on a straight-line basis over the vesting period, based on the stocks fair market value on the grant date. For restricted stock grants issued with performance conditions, compensation expense is recognized over each vesting tranche. We recognize compensation expense for only the portion of restricted stock and stock units that is expected to vest, rather than record forfeitures when they occur. If the actual number of forfeitures differs from those estimated by management, additional adjustments to compensation expense may be required in the future periods. We determine the fair value of options to purchase common stock using the Black-Scholes valuation model, which requires the input of subjective assumptions. We recognize expense over the service period for options that are expected to vest and record adjustments to compensation expense at the end of the service period if actual forfeitures differ from original estimates. Purchases of our common stock are not displayed separately as treasury stock on the Consolidated Balance Sheets in accordance with the Washington Business Corporation Act, which requires the retirement of purchased shares. As a result, shares of our common stock that we purchase are retired immediately. It is our accounting policy to first record these purchases as a reduction to our Common stock account. Once the Common stock account has been reduced to a nominal balance, remaining purchases are recorded as a reduction to our Retained earnings account. Furthermore, activity in our common stock account related to stock-based compensation is also recorded to Retained earnings until such time as the reduction to Retained earnings due to stock repurchases has been recovered. See Note 10 and Note 14 for further discussion of share purchases and stock-based compensation, respectively. Shares outstanding include shares of unvested restricted stock. Unvested restricted stock included in reportable shares outstanding was 0.7 million shares and 0.9 million shares as of December 31, 2010 and December 25, 2009, respectively. Shares of unvested restricted stock are excluded from our calculation of basic weighted average shares outstanding, but their dilutive impact is added back in the calculation of diluted weighted average shares outstanding. There are no recent accounting pronouncements that are applicable to us. We acquired substantially all of the assets of TLC Services Group, Inc. (TLC) in February 2008. The total cost of the acquisition was $5.5 million. Founded in 1975, TLC was a skilled truck-driver staffing provider that operated across multiple states out of 10 locations. Effective January 4, 2010, we changed the name to Centerline Drivers, LLC. We acquired all of the stock of Personnel Management, Inc. (PMI) in April 2008. The total cost of the acquisition was $17.0 million. PMI is a light industrial staffing company, which added 44 branches to our light industrial network. This acquisition expanded our reach into key, adjacent markets where Spartan Staffing operates with long-standing client relationships and experienced, tenured branch employees. PMI was integrated with Spartan Staffing starting in fiscal 2009. For additional information regarding the accounting of acquisition related intangible assets refer to Note 8. Management determines the appropriate classification of our investments in debt and equity securities (Marketable Securities) at the time of purchase and re-evaluates such determination at each balance sheet date. Previously held Marketable Securities consisted of revenue bonds and other municipal obligations, which had maturities or reset dates of one year or less. The specific identification method is used for computing realized gains and losses on the sale of available-for-sale securities. For 2008, there were no material realized gains and losses on sales of available-for-sale securities. We did not invest in any marketable securities during 2010 or 2009. Restricted cash consists primarily of cash held by our insurance carriers as collateral for our workers compensation program. This cash is provided directly to our insurance carriers for the purpose of collateralizing our workers compensation obligations. These instruments include cash-backed letters of credit, cash-backed bonds, and cash deposits held by our insurance carriers. Collateral represents instruments that have been provided or pledged to an insurance company for either the direct payment of claims, or to cover the cost of claims in the event we are unable to make payment. The majority of our collateral is held by Chartis, a subsidiary of American International Group, Inc.
Our cash equivalents and investment instruments are classified within Level 1 of the fair value hierarchy. As of December 31, 2010 and December 25, 2009, our Level 1 investments consisted of money market accounts totaling $133.2 million and $61.7 million, respectively. Our Level 1 investments were recorded as Cash and cash equivalents in our Consolidated Balance Sheets. We held no Level 2 or Level 3 investments as of December 31, 2010 or December 25, 2009. Construction in progress consists primarily of internally developed software. As of December 31, 2010 and December 25, 2009, capitalized software development costs, net of accumulated amortization, were $32.8 million and $35.7 million, respectively, excluding amounts in Construction in progress. Depreciation and amortization of Property and equipment totaled $13.8 million, $13.9 million and $9.8 million in 2010, 2009 and 2008, respectively. We provide workers compensation insurance for our temporary and permanent employees. The majority of our current workers compensation insurance policies cover claims for a particular event above a $2.0 million deductible limit, on a per occurrence basis. This results in our being substantially self-insured. Our workers compensation insurance policies are renewed annually. We had coverage with Chartis for occurrences during the period from July 2009 to July 2010 and renewed our coverage with Chartis effective July 2010 to July 2011. For all prior years, we had coverage with Chartis and other insurance providers. Furthermore, we have full liability for all further payments on claims that originated between January 2001 and June 2003, without recourse to any third party insurer as the result of a novation agreement we entered into with Kemper Insurance Company in December 2004. For workers compensation claims originating in Washington, North Dakota, Ohio, Wyoming, Canada and Puerto Rico (our monopolistic jurisdictions) we pay workers compensation insurance premiums and obtain full coverage under government-administered programs (with the exception of our Labor Ready brand in the state of Ohio where we have a self-insured policy). Accordingly, because we are not the primary obligor, our financial statements do not reflect the liability for workers compensation claims in these monopolistic jurisdictions. Our workers compensation reserve is established using estimates of the future cost of claims and related expenses that have been reported but not settled, as well as those that have been incurred but not reported. Management evaluates the adequacy of the workers compensation reserves in conjunction with an independent quarterly actuarial assessment. As of December 31, 2010 and December 25, 2009 the discounted workers compensation claims reserves were $187.3 million and $189.5 million, respectively. Our workers compensation reserve for claims below the deductible limit is discounted to its estimated net present value using discount rates based on average returns of risk-free U.S. Treasury instruments available during the year in which the liability was incurred. At December 31, 2010, the weighted average rate was 3.3%. The claim payments are made over a weighted average period of approximately 5.5 years. Our workers compensation reserves include estimated expenses related to claims above our deductible limits (excess claims), and a corresponding receivable for the insurance coverage on excess claims based on the contractual policy agreements we have with insurance carriers. We discount this reserve and corresponding receivable to its estimated net present value using the discount rates based on average returns of risk-free U.S. Treasury instruments available during the year in which the liability was incurred. At December 31, 2010, the weighted average rate was 5.1%. The claim payments are made and the corresponding reimbursements from our insurance carriers are received over a weighted average period of approximately 19.5 years. The discounted workers compensation reserve for excess claims and the corresponding receivable for the insurance on excess claims were $25.8 million and $24.7 million as of December 31, 2010 and December 25, 2009, respectively. Two of the workers compensation insurance companies (Troubled Insurance Companies) with which we formerly did business are in liquidation and have failed to pay a number of excess claims to date. These excess claims have been presented to the state guaranty funds of the states in which the claims originated. Some of these excess claims have been rejected by the state guaranty funds due to statutory eligibility limitations. We have recorded a valuation allowance against the insurance receivable to reflect amounts that may not be realized. Our valuation allowance against receivables from Troubled Insurance Companies as of December 31, 2010 and December 25, 2009 is $7.6 million and $6.8 million, respectively. Total discounted receivables from insurance companies, net of the valuation allowance, as of December 31, 2010 and December 25, 2009 are $18.1 million and $17.9 million, respectively and are included in Other assets, net in the accompanying Consolidated Balance Sheets. (1) Excludes assets that are fully amortized. Intangible assets are amortized using the straight-line method over their estimated useful lives. Amortization of our long-lived intangible assets was $2.7 million, $3.2 million and $7.0 million for 2010, 2009 and 2008, respectively. Goodwill and long-lived intangible assets are reviewed for impairment whenever events and circumstances indicate the carrying value may not be recoverable. In the fourth quarter of 2008, we experienced a significant decline in our stock price. As a result of the decline in stock price, our market capitalization fell significantly below the recorded value of our consolidated net assets. The reduced market capitalization reflected, in part, the current economic climate at the time, as well as expected continued weakness in pricing and demand for our temporary staffing services. As a result of our 2008 assessment, we concluded that the carrying amounts of goodwill for the CLP, Spartan Staffing and Centerline reporting units exceeded their implied fair values and we recorded non-cash impairment losses of $46.1 million, which was included in impairment of goodwill and indefinite-lived intangible assets on our Consolidated Statement of Operations for the fiscal year ended December 26, 2008. Our assessment of goodwill impairment indicated that as of December 26, 2008, the fair value of each of the Labor Ready and PlaneTechs reporting units exceeded its carrying value and therefore goodwill was not impaired. In addition, we tested our long-lived intangible assets for impairment and determined that certain intangible assets associated with the CLP, Spartan Staffing and Centerline asset groups, primarily customer relationships, were impaired mainly due to the revised lower revenue and profit forecasts associated with those customer relationships acquired with the acquisitions of CLP, Spartan Staffing and Centerline. We measured the amount of impairment by calculating the amount by which the carrying value of these assets exceeded their estimated fair values, which were based on projected undiscounted future net cash flows. As a result of this review, in 2008 we recorded non-cash impairment losses totaling $14.9 million. The non-cash impairment loss was included in impairment of goodwill and intangible assets on our Consolidated Statement of Operations for the fiscal year ended December 26, 2008. The net loss for 2008 includes a total goodwill and intangible asset impairment charge of $61.0 million. In fiscal 2009 and 2010 we identified no impairments of goodwill or long-lived intangible assets. We have authorized 20 million shares of blank check preferred stock. The blank check preferred stock is issuable in one or more series, each with such designations, preferences, rights, qualifications, limitations and restrictions as our Board of Directors may determine and set forth in supplemental resolutions at the time of issuance, without further shareholder action. The initial series of blank check preferred stock authorized by the Board of Directors was designated as Series A Preferred Stock. We had no outstanding shares of preferred stock in any of the years presented. We did not purchase any shares of our common stock under our authorized share purchase program during 2010 and 2009. As of December 31, 2010 we had $21.5 million worth of our common stock available to us for future purchases under the current authorization. Pursuant to our share purchase program, we purchased 1.2 million shares at a total cost of $16.0 million, including commissions during 2008. Our effective income tax rate was 32.0% in 2010, as compared to 37.8% in 2009 and 151.0% in 2008. Results for 2008 include a goodwill and intangible asset impairment charge of $61.0 million. Excluding this impairment charge, net income would have been $45.2 million or an effective tax rate of 34.7%. The principal difference between the statutory federal income tax rate of 35.0% and our 2010 effective income tax rate results from state and foreign income taxes, federal tax credits, and certain non-deductible expenses. Our 2010 effective tax rate of 32.0% was lower than our 2009 rate of 37.8% primarily due to the tax benefit related to the favorable development of a federal income tax matter. Our 2008 effective tax rate of 34.7% excluding the effect of the impairment charge was lower than our 2009 rate primarily due to the favorable resolution of certain state income tax matters during 2008. At December 31, 2010, Labor Ready Puerto Rico, Inc. has net operating loss carry-forwards of approximately $2.1 million expiring in 2012 through 2020. A valuation allowance has been established against our carry-forward tax benefits based on our history of past losses. We recognize interest and penalties related to unrecognized tax benefits within the income tax expense line in the accompanying Consolidated Statements of Operations. Accrued interest and penalties are included within the related tax liability line in the Consolidated Balance Sheets. As of December 31, 2010 our liability for unrecognized tax benefits was $1.6 million, all of which, if recognized, would impact our effective tax rate. This liability is recorded in Other non-current liabilities in our Consolidated Balance Sheets. In general, the tax years 2007 through 2009 remain open to examination by the major taxing jurisdictions where we conduct business. Related to the unrecognized tax benefits noted above, we accrued penalties of $0.1 million and interest of $0.1 million during 2010 and in total, as of December 31, 2010, have recognized a liability for penalties of $0.2 million and interest of $0.4 million. Basic net income per share is calculated by dividing net income by the weighted average number of common shares outstanding during the period. Diluted net income per share is calculated by dividing net income by the weighted average number of common shares and potential common shares outstanding during the period. Potential common shares include the dilutive effects of outstanding options, non-vested restricted stock and performance share units except where their inclusion would be anti-dilutive. Anti-dilutive shares associated with our stock options relate to those stock options with a grant price higher than the average market value of our stock during the periods presented. Anti-dilutive shares also include in-the-money options, unvested restricted stock and performance share units for which the sum of the assumed proceeds, including unrecognized compensation expense, exceeds the average stock price during the periods presented. Common stock equivalents related to stock options and unvested restricted stock of 0.2 million are anti-dilutive in a net loss year and, therefore, are not included in the 2008 diluted net loss per share. On June 22, 2009, we entered into a Credit Agreement with Wells Fargo Foothill, LLC and Bank of America, N.A. for a secured revolving credit facility of up to a maximum of $80 million (the Revolving Credit Facility). The Revolving Credit Facility, which expires in June 2012, replaced our existing $80 million revolving credit facility with Wells Fargo Bank, N.A. and Bank of America, N.A., which was set to expire in April of 2011. As of December 31, 2010, the maximum $80 million was available under the Revolving Credit Facility and $11.0 million of letters of credit have been issued against the facility, leaving an unused portion of $69.0 million. The unused portion of the Revolving Credit Facility of 0.375%. The Revolving Credit Facility requires that we maintain liquidity in excess of $30 million. We are required to satisfy a fixed charge coverage ratio in the event that liquidity falls below $30 million. The liquidity level is defined as the amount we are entitled to borrow as advances under the Revolving Credit Facility plus the amount of cash and cash equivalents held in accounts subject to a control agreement benefiting the lenders. The amount we were entitled to borrow at December 31, 2010 was $69.0 million and the amount of cash and cash equivalents under control agreements was $159.5 million for a total of $228.5 million, which was in excess of our $30 million liquidity requirement. We are currently in compliance with all covenants related to the Revolving Credit Facility. The Revolving Credit Facility limits the amount of our common stock we can purchase to $10 million during any twelve month period and the aggregate of cash dividends we pay cannot exceed $5 million at any time, unless we obtain consent from our lenders to increase these amounts. Our insurance carriers and certain state workers compensation programs require us to collateralize a portion of our workers compensation obligation, for which they become responsible should we become insolvent. The collateral typically takes the form of cash and cash-backed instruments, letters of credit, and/or surety bonds. The letters of credit bear fluctuating annual fees as described in the section above. Our surety bonds are issued by independent insurance companies on our behalf and bear annual fees based on a percentage of the bond, which are determined by each independent surety carrier, subject to a minimum charge, but not to exceed 2.0% of the bond amount. The terms of these bonds are subject to review and renewal every one to four years and most bonds can be canceled by the sureties with as little as 60 days notice. We have property held under non-cancelable capital leases reported in Property and equipment, net on the Consolidated Balance Sheets totaling $0.3 million and $0.7 million, net of accumulated depreciation at December 31, 2010 and December 25, 2009, respectively. Our capital lease obligations are reported in Other current liabilities in the Consolidated Balance Sheets. Future minimum lease payments under these non-cancelable capital leases as of December 31, 2010 are $0.3 million for 2011.
renewal. However, for the majority of our leases, both parties to the lease have the right to cancel the lease with 90 days notice. Accordingly, we have not included the leases with 90 day cancellation provisions in our disclosure of future minimum lease payments. Total branch office rent expense for 2010, 2009 and 2008 was approximately $22.6 million, $24.8 million and $29.0 million, respectively. We are involved in various proceedings arising in the normal course of conducting business. We believe the amounts provided in our consolidated financial statements are adequate in consideration of the probable and estimable liabilities. The resolution of those proceedings is not expected to have a material effect on our results of operations or financial condition. Stock-based compensation includes expense charges for all stock-based awards to employees and directors. Such awards include restricted stock awards, performance share units, stock options, and shares purchased under an employee stock purchase plan (ESPP). No capitalized stock-based compensation was included in Property and equipment, net on the Consolidated Balance Sheets for 2010, 2009 or 2008. Stock-based awards are issued under our 2005 Long-Term Equity Incentive Plan. Restricted stock is granted to officers and key employees and vests annually over periods ranging from three to four years. Stock granted to our directors vests immediately. Restricted stock-based compensation expense is calculated based on the grant-date market value. We recognize compensation expense on a straight-line basis over the vesting period for the awards that are expected to vest. In February 2010, the Compensation Committee determined that performance share units should be issued to executives instead of stock options. Vesting of the performance share units is contingent upon the Companys achievement of revenue and profitability goals at the end of each three-year performance period. Compensation expense, based on the estimated performance payout, is recognized ratably over the performance period. Our estimate of the performance payout is reviewed and adjusted as appropriate each quarter. (1) Weighted average market price on grant date. As of December 31, 2010, total unrecognized stock-based compensation expense related to non-vested restricted stock and performance share units was approximately $7.5 million, which is expected to be recognized over a weighted average period of 1.6 years through 2014. The total fair value of restricted shares vesting during 2010, 2009 and 2008 was $5.4 million, $5.0 million and $4.7 million, respectively. Our 2005 Long-Term Equity Incentive Plan provides for both nonqualified stock options and incentive stock options (collectively, stock options) for directors, officers, and certain employees. We issue new shares of common stock upon exercise of stock options. The majority of our unvested stock options cliff vest in three years from the date of grant and expire if not exercised within seven years from the date of grant. The maximum contractual term for our outstanding awards is ten years. The fair value of each stock option granted is estimated on the grant date using the Black-Scholes valuation model, and the resulting expense is recognized over the requisite service period for each separately vesting portion of the award. The assumptions used to calculate the fair value of options granted reflect market conditions and our experience. Compensation expense is recognized only for those options expected to vest, with forfeitures estimated based on our historical experience and future expectations. The aggregate intrinsic value in the table above is the amount by which the market value of the underlying stock exceeded the exercise price of outstanding options, before applicable income taxes and represents the amount optionees would have realized if all in-the-money options had been exercised on the last business day of the period indicated. The closing per share market value of the Companys stock on December 31, 2010 was $17.99. As of December 31, 2010, total unrecognized stock-based compensation expense related to non-vested stock options was approximately $0.5 million, which is expected to be recognized over a weighted average period of 1.1 years through 2013. The total intrinsic value of options exercised during 2010, 2009 and 2008 was $0.2 million, $0.2 million and $0.6 million, respectively, determined as of the date of exercise. Cash received from option exercises, net of tax withholdings, during 2010, 2009 and 2008 was $0.2 million, $0.1 million and $2.1 million, respectively. There was de minimis tax benefit realized for the tax deduction from option exercises during the years 2010 and 2009. The actual tax benefit realized for the deduction from option exercises during 2008 was 0.2 million. Our 2010 Employee Stock Purchase Plan (2010 ESPP) became effective on July 1, 2010, replacing our 1996 Employee Stock Purchase Plan, which expired on June 30, 2010. Our ESPP allows eligible employees to contribute up to 10% of their base earnings toward the monthly purchase of the Companys common stock. The employees purchase price is the lesser of 85% of the fair market value of shares on either the first day or the last day of each month. Under the 1996 Employee Stock Purchase Plan, 1.9 million shares of common stock had been reserved for purchase, of which 1.7 million shares had been purchased prior to the cancelation of the plan. We have reserved for purchase under the 2010 ESPP 1.0 million shares of common stock, of which 36,000 shares have been issued. We consider our ESPP to be a component of our share-based compensation and accordingly we recognize compensation expense over the requisite service period for stock purchases made under the plan. The requisite service period begins on the enrollment date and ends on the purchase date, the duration of which is one month. We evaluated other events and transactions occurring after the balance sheet date through the date that the financial statements were issued, and noted no other events that were subject to recognition or disclosure. Conclusion Regarding the Effectiveness of Disclosure Controls and Procedures. Under the supervision and with the participation of our management, including the Chief Executive Officer and Chief Financial Officer of the company, we have evaluated the effectiveness of our disclosure controls and procedures as required by Exchange Act Rule 13a-15(e) as of the end of the period covered by this report. Based on that evaluation, the Chief Executive Officer and Chief Financial Officer have concluded that these disclosure controls and procedures are effective. Managements Annual Report on Internal Control Over Financial Reporting. Our management is responsible for establishing and maintaining adequate internal control over financial reporting for the company. Internal control over financial reporting is a process to provide reasonable assurance regarding the reliability of our financial reporting for external purposes in accordance with accounting principles generally accepted in the United States of America. Internal control over financial reporting includes maintaining records that in reasonable detail accurately and fairly reflect our transactions; providing reasonable assurance that transactions are recorded as necessary for preparation of our financial statements; providing reasonable assurance that receipts and expenditures of company assets are made in accordance with management authorization; and providing reasonable assurance that unauthorized acquisition, use, or disposition of company assets that could have a material effect on our financial statements would be prevented or detected on a timely basis. Because of its inherent limitations, internal control over financial reporting may not prevent or detect misstatements. Management conducted an evaluation of the effectiveness of our internal control over financial reporting based on the framework in Internal Control  Integrated Framework issued by the Committee of Sponsoring Organizations of the Treadway Commission. Based on this evaluation, management concluded that the Companys internal control over financial reporting was effective as of December 31, 2010. The effectiveness of our internal control over financial reporting as of December 31, 2010 has been audited by Deloitte & Touche LLP, an independent registered public accounting firm, as stated in their report, which is included herein. Changes in Internal Control Over Financial Reporting. During the fourth quarter ended December 31, 2010, there were no changes in our internal control over financial reporting that have materially affected, or are reasonably likely to materially affect, our internal control over financial reporting.